A blustery, biting cold wind greeted racegoers at Charm Park and as a result the crowd was on the low side. The going was officially Good, although in my opinion it was somewhat softer than that. It rode extremely well and there were plenty of runners. The Hunt Members was for horses qualified with both the Derwent and Staintondale and attracted five runners. The spoils were claimed by Willywont He under Steve Charlton, whose customary late charge was too good for his more modest opposition. 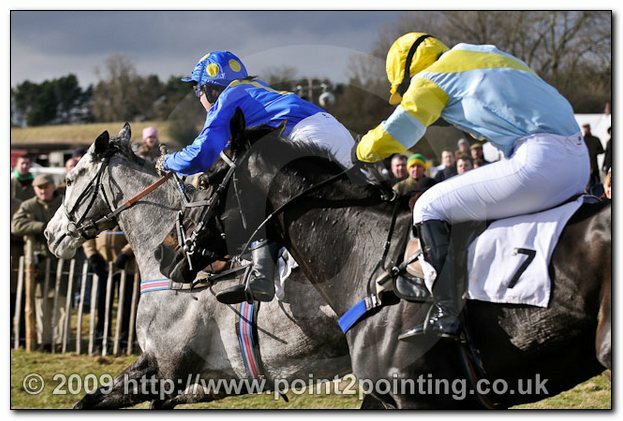 At Duncombe Park last week, his jumping had been poor and in fairness still left something to be desired here, however it wasn’t quite as bad. He has the potential for more success in a much higher grade. Dreamaker (Oliver Pimlott) in second made Willywont He have to work a bit. Dreamaker had been left in front at the start of the final circuit and kept on steadily once headed going to the last. He ought to find a maiden. In A Good Way was coaxed through the final half mile by Guy Brewer to be third. The youngster gained more valuable experience for the future. 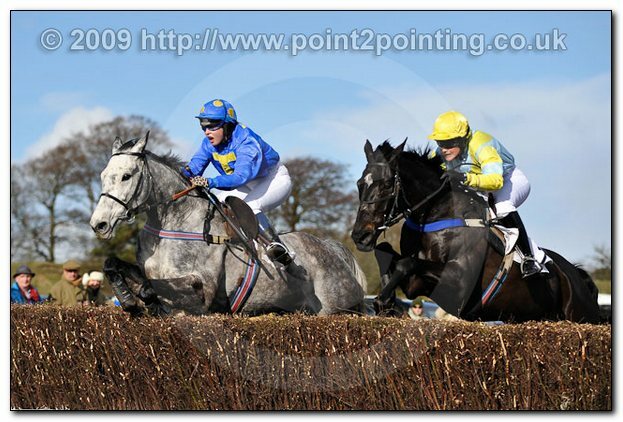 The second favourite Misty Gem came down at the 10th and Abbey Whin was a casualty at the next whilst in his usual position at the head of affairs. The 13-runner Confined went to Unjust Law and Tom Greenall. Confidently ridden, Unjust Law made headway approaching six out and led turning for home, after which he never looked like getting caught. There are no fitness concerns for competitors any more now that the freezing weather is completely behind us, once their seasonal bows are out of the way. He had shaped like a non-stayer when third at Brocklesby Park last month, but this fair test doesn’t inconvenience those horses that may have slight stamina doubts. Runner-up Glenelly Gale had the run of the race up front for Becky Mason and remained out there for most of the journey. Despite his advancing years, Glenelly Gale has lost none of his zest at this level. Over To Joe the jolly got outpaced before plodding on for third in the hands of Simon Walker. Abandon Ship in fourth has some ability and tries his best. He usually runs his race, but whether he is quite good enough to win one of these remains to be seen. Be The Tops made a satisfactory reappearance and should come into his own in the spring. 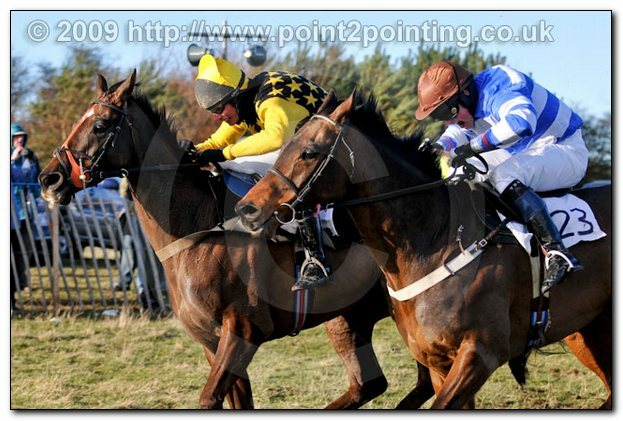 Keen Whip, an impressive Brocklesby Park restricted winner in February, came to grief at the 2nd and The Nomad was pulling hard and prominent when he got rid of Jo Mason at the same fence on the following lap. Nine horses went to post for the Mens Open and there was a creditable display from Le Passing, with Toby Greenall in the plate. When the pace increased appreciably, Le Passing got first run on his rivals and they were struggling to peg the ten-year-old back thereafter. Provided the course isn’t too stiff a test of stamina, he should continue to make his presence felt. Simon Walker’s mount Johnny Venture came second and was made favourite on the back of a tidy Brocklesby Park confined victory where the respectable performers Gun Smith and Unjust Law filled the places. He couldn’t respond when Le Passing was kicked on, but it was a sound initial effort in an open. Distant Memory excelled himself for Nick Kent in third. This fellow had only got off the mark at the fifth attempt last time in a weak club race at North Carlton. Beaten an official seven lengths here, he is clearly a good deal better than that. The blinkered Lou Du Moulin Mas came fourth. He’d not been in any sort of form previously this year, but although readily left behind by the principals, this was a bit more like it. A generally consistent sort under Rules who took any type of going except the extremes in his stride, L’Oudon gave some hope for the time ahead. Several of the ten combatants in the Ladies Open could be given a reasonable chance and it was nip and tuck all the way to the judge, where Blandings Castle and Pip Tutty were triumphant from Encore Cadoudal under Tina Jackson. The style in which Blandings Castle knuckled down to the job in hand was first class. He is quite a taking individual and had gone into a few notebooks when third at Brocklesby Park last month without getting seriously into the argument. He was basically a two miler at the professional game when with Nick Williams and was knocked down for 5000gns at Doncaster last August. Blandings got the trip fine and there is no reason to suggest that he won’t continue to give a good account of himself. Encore Cadoudal pushed Blandings Castle every step of the way and there was just half a length between them at the lollipop. He had obviously reaped the reward of his reappearance at Witton Castle, where he was far from disgraced behind Narciso. Third-placed One Five Eight (Laura Mason) kept on, although the pair ahead of him had flown. He is vulnerable to the new crop of talent such as Blandings Castle, but can’t be totally discounted quite yet. 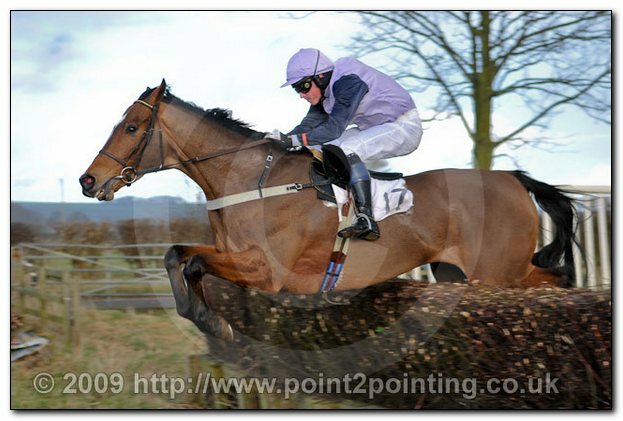 Cop Howe was a warm order after putting Network Oscar to the sword in the Sinnington hunt race, but he could only manage fourth. He was held up behind, made progress in the back straight, but soon flattened out over the three fences in the homeward run. He is better than this and shouldn’t be written off yet. There were several hard luck stories. The capable Lutin Du Moulin was bang there when he went lame after five out, while Plutocrat was restrained in rear, made rapid headway on the outside turning onto the far side, but crashed out at the open ditch whilst disputing the lead, bringing down Delfinia who was on the retreat. Mister Magnum looks to have a future in opens as he seemed to get tapped for toe, but rallied to have a squeak when he decanted Lucy Bell. A field of ten was assembled for the Restricted, which had a thrilling finish. Elusive Swallow and Nathan Moscrop battled it out with My Old Piano and Tom Greenall, with victory going to the latter by a head. It was tenacity that gained the day and he really stuck to his task to score in gritty fashion. My Old Piano had been backed off the boards when he tipped up at Witton Castle in February, but he’ll have repaid supporters here. The Sheriff Hutton maiden that he won in January is already working out well as three subsequent maiden winners have come out of it so far. Elusive Swallow lost nothing in defeat and didn’t shirk the issue when tackled by My Old Piano. She has soon become a firm favourite with pointing followers for her never say die attitude. Her Corbridge conqueror a week ago Coastley is being lined up for big things and Elusive Swallow fully deserves to carry off a restricted of her own. Goforthegap was well held in third and is a bit difficult to weigh up. Even so, representing the all powerful Easterby team, he should be up to one of these races. Loaded Dice was a one-paced fourth. He isn’t blessed with an awful lot of speed, but equally doesn’t come up short for effort. Poppy Day was a fair third when she unseated Jo Mason at the final fence. Not a bad first try in a restricted. 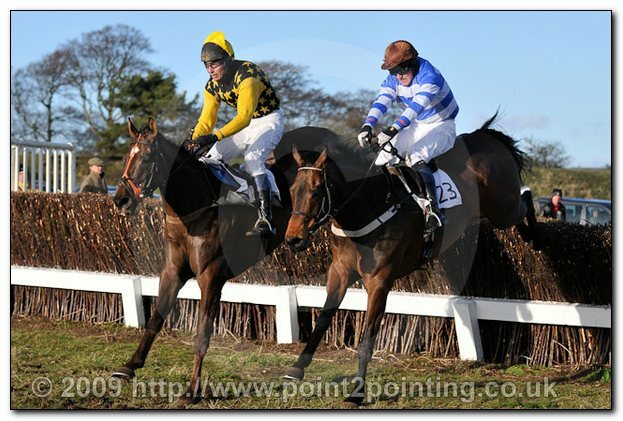 Having survived a howler at the 10th, River Line was up with the pace when he got carried out by Oaklands Ted at the 12th. There were plenty of backward types and deadwood among the 16 horses that faced the starter in Division One of the Maiden, but that shouldn’t detract from the favourable impression created by Phenix Jack, who gave Tom Greenall a treble on the card. Phenix Jack bowled along in front, had an advantage of about six lengths at the first fence and ended up making every yard. He was given a bit of a breather part of the way round and had loads left in the locker when Calapocus posed a brief threat after four out. 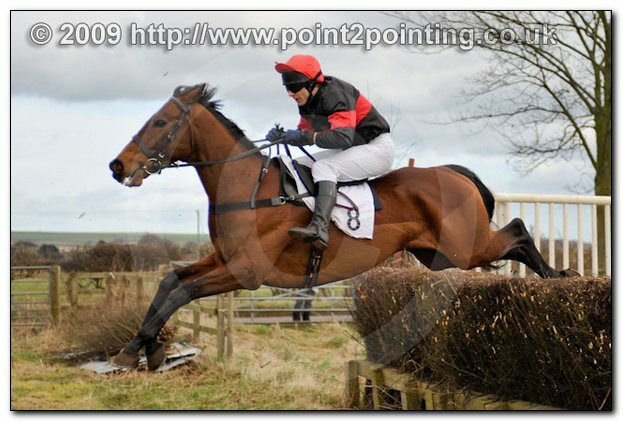 Phenix Jack had run out of puff when adopting similar tactics at Bangor on his pointing debut, but he showed no signs of stopping on this occasion. Jake Greenall bided his time on Calapocus, but it swiftly became a vain chase when Phenix Jack quickened up. Calapocus was pretty much running on empty at the climax, being 20 lengths back at the winning post, however he was the only horse to give the winner anything to think about. In essence, this was a similar level of ability to that which he had showed when third to Scrappie at Duncombe Park. Very few of the rest got in the least bit competitive. Putting in his best work in the home straight to be third was Hailes Hill Lad (Miles Seston). He couldn’t get anywhere near the front two, but this does rank as a step in the right direction. 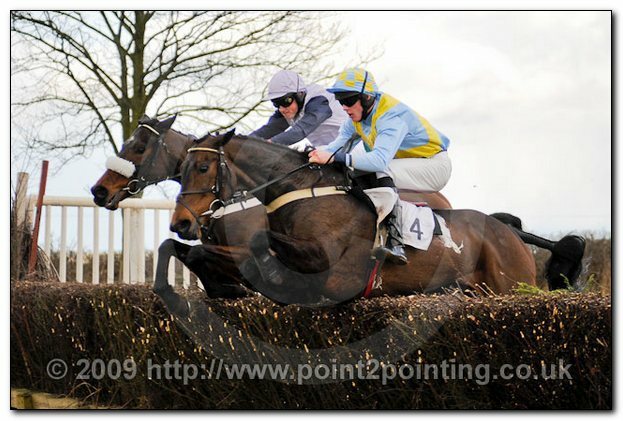 Miss Sunflower was just behind in fourth, reversing Witton Castle form with Nina Chester, who was behind her this time. The meeting culminated in Division Two of the Maiden, which didn’t disappoint, and 14 horses came under orders. Although lacking strength in depth, the front three had it between them over the final four fences. 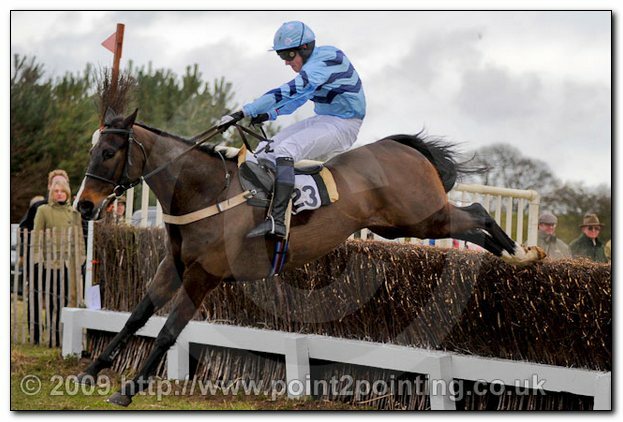 There was a lot to like about the way in which Fli Mi Son went about his business under a canny ride. Deputising for Mark Walford who was hurt earlier in the afternoon, Chris Dawson recorded a first success since returning from injury himself. Fli Mi Son was pressed by Snake Rave from the penultimate obstacle and pulled out all the stops to defy his opponent by a head. Fli Mi Son is a bright prospect who is likely to be brought along quietly. Snake Rave tried his best on the run-in, but found Fli Mi Son just too strong. Tom Greenall’s partner had been a never dangerous third at Duncombe Park under apparently considerate handling. Here, unsurprisingly, Snake Rave was the subject of a major plunge in the ring, opening in one place at 6-4, but generally 11-8 was widely available, and being backed into 4-7 and 1-2. The gamble went awry, but Snake Rave probably bumped into an above average sort. He should go one better soon. Cherryland took up the running under Guy Brewer after Intense Suspense departed and injected immediate impetus that stretched the field out. He was a promising third and, on this evidence, has a maiden within his grasp. Jabo kept on at the one pace in fourth. Intense Suspense was leading when he ejected Toby Greenall at the open ditch. It was too far out to say where he would have finished. Darazari Bay offered a glimmer of hope for the future.